Dr. George R. Christie (1858-1947) was Todd County's oldest physician and surgeon. He was born and raised in Berlin, Wisconsin, the son of Scottish immigrants. Dr. Christie graduated from Rush Medical College in Chicago in 1882. In 1884 he came to Long Prairie at the urging of Dr. Lewis of Sauk Centre, Sinclair Lewis' father. Dr. Christie made many house calls from the days when travel on foot often had to take the place of horse and buggy, by train, and into the days of the automobile. He set up an office on Central Avenue and owned and operated the Riverside Hospital at 101 First Street North. In 1887 Dr. Christie married Susan West (1859-1910), a schoolteacher, in Milwaukee, Wisconsin. In the 1890s George and Susan lived in the "old house" on what is now Gene-O's lot. 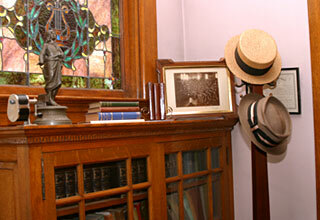 Susan helped establish the Long Prairie Literary Society in 1893. In the Literary Society report celebrating one century, Susan is remembered for her piano accompaniment in Chataqua performances held at the local opera house. Dr. Christie was an influential man in business and community organizations. He served as chairman of the school board. He was one of the original incorporators of the Bank of Long Prairie in 1890. He was a bank director, becoming its president in 1904. A partner in the banking business, William E. Lee, and Dr. Christie traveled to Washington, D. C. to carry the state's electoral vote in the 1901 election of U.S. President McKinley. Following the death of his first wife, Susan, Dr. George married a childhood friend, Ida Lewis Mason, in 1911. Ida, also widowed, was a domestic science teacher living in Chicago. She was an expert needle worker. Her only child, Lucille Mason, died in 1910. 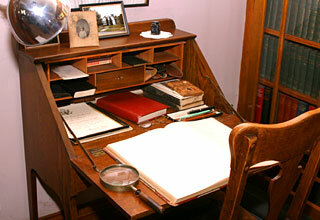 Ida helped establish the first public library in Long Prairie. Ida Christie died in 1944. Dr. Robert L. Christie graduated from the University of Minnesota's Medical school in 1917, completed a surgical internship and served as a lieutenant in the Navy in Word War I, then joined his father's practice. He became a well-known skin specialist and was a consultant for the Mayo Clinic. Both Dr. George and Dr. Robert performed surgeries at Asbury Hospital in Minneapolis. 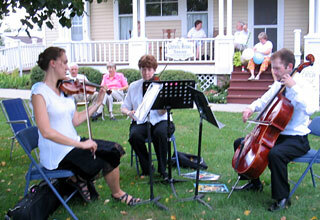 In later years they practiced from an office set up in the library of their home. The kitchen was used as a reception area. After his father's death, Robert lived alone in the house, and continued to see patients there until 1976. The Christies provided medical care in Long Prairie for more than 90 years. The four Christie children were George West Christie (1890-1956), who became a newspaper editor in Red Lake Falls; Dr. Robert L. Christie (1892-1976): Edith Lisle Christie (1894-1902), who died at the age of eight from peritonitis and septicemia; and Donald R. Christie (1896-1985), who became a banker at Perham. George was married to Eva Lindbergh (1892-1985), a half sister of Charles Lindbergh, from Little Falls. Donald was married to Frances Bennett (1899-1990), a niece of Ida Christie. Dr. George and Susan Christie, their four children and two daughters-in-law are buried in the Long Prairie cemetery. George and Eva's children were Lillian (1917), journalist, and George Jr. (1922), retired newspaperman. Both live in Mora, Minnesota. Donald and Frances' children were Dr. Donald, DDS (1923-2004) and William (1924-1998); attorney, both in Washington state. 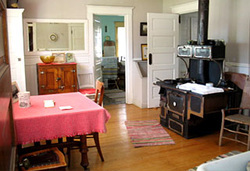 According to the State Historical Society the property is unique and valuable because the home has remained unchanged over the years. 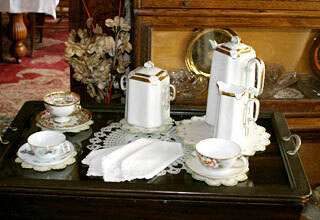 Only the Christie family lived here and the furnishings and artifacts displayed are original to them. 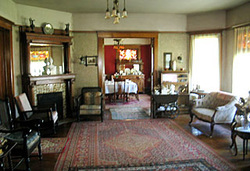 The house was built in 1901 at a cost of $5000. The architect was C.W. Smith from Long Prairie. Blueprints, hand-drawn to scale on white linen, are on display in the carriage house. The blueprints have been followed in all repairs and renovations of the property. Wood milling for the house was done at the Schomaker Mill on the west side of town. 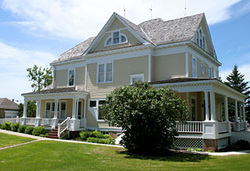 The Christie house was donated to the city of Long Prairie in 1976 following the death of Dr. Robert L. Christie---the donors being Mr. and Mrs. Donald R. Christie. 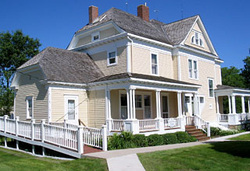 The Christie Home Historical Society, a non-profit corporation, was organized to preserve the house. 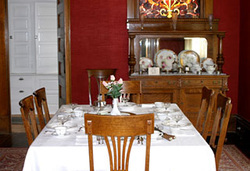 Interior repairs to the house have included new dining room and kitchen ceilings, one rebuilt wall in the kitchen, sanding the beautiful maple floors, as well as replacing some curtains and wall-coverings to represent the early 1900s. The house was opened to the public in 1976. 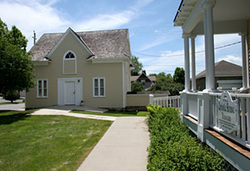 The carriage house is used as an interpretive center. The floorboards are the originals, turned over. Horse stalls are in the basement. The hayloft and basement are not open to the public. From the outside we see the side door where horses entered. 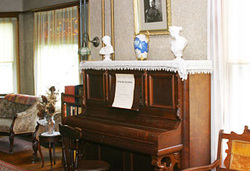 Lifetime interests of the Christie sons are included in the museum. Donald R. Christie's duck decoy collection is displayed in the carriage house. 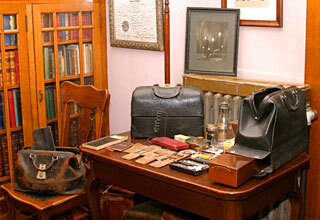 Shriner items from when George West Christie served as Grandmaster of the Minnesota Masons are displayed in the attic. Dr. Bob Christie was the first Minnesota Amateur Billiards Champion. He was also a good golfer. A trophy for golf is in the house. 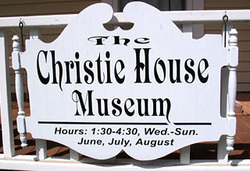 Volunteer members of the Christie Home Historical society are available to guide visitors through the rooms of the house, in which they will see "pride in workmanship and talent-preserved-as a memorial to the substantial but gracious living of that period of history." 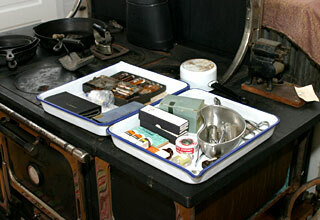 Copper boilers, wash tubs, scrub boards, and bar soap were necessities of the time. Displayed on the clothes rack are the original living room curtains. Surgery was done on the kitchen table as late as 1917. The range has a reservoir for keeping water hot and implements used to keep the fire burning steadily. The basement door opens to a brick-faced wall. Dr. Bob's billiard table was in the basement. The back stairs (maid's stairs) are unique because they curve and because of the handsome oak wainscoting. The attic skylight gives natural light for artistic painting or handwork. Glass in the original windowpanes is wavy. The hooks near the ceiling are for clotheslines. The light fixtures and electric meter are primitive. Seen from the north window is the old Riverside Hospital at 101 First Street North. It is now a private residence. 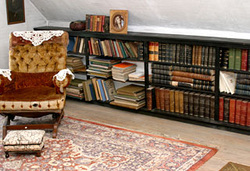 Part of the 1550 volume book collection is stored in the attic. The two walnut beds are a carry-over from when the Christie children used the attic as a dormitory. Old trunks were used for railway travel. A beautiful curve highlights the hall's structure. A built-in hall cupboard stores linens. Outdoor toilets were the mode of the day, with plumbing added to the house about 1910. The ball-and-claw-foot bathtub, the lavatory with grillwork, and the small water reservoir in the closet are original. The wallpaper is original. It is a fine illustration of the border printed directly on it. A kerosene lamp was needed for times primitive electric lights failed. Chamber pots augmented the plumbing system. All the bedrooms have walk-in closets. The massive mahogany bed and dresser are of the sleigh design. 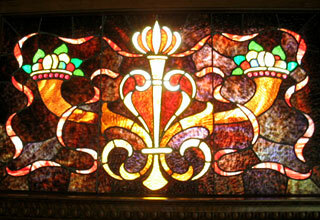 The stained glass window is the Lotus Blossom pattern. Wall and ceiling light fixtures are signed Tiffany glass from New York. The wallpaper is very much like the original in color and pattern. 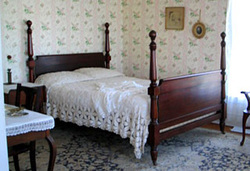 The two rooms have matching mahogany furniture-four poster beds, dresser and highboy dresser. Pocket doors separate the two rooms. 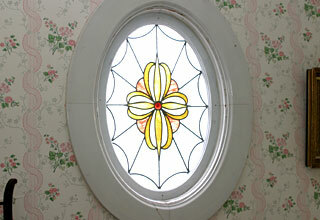 The oval stained glass window is the Dogwood pattern. When the boys used the attic as their dormitory, this rooms was a guestroom. The hand carving and brass work on the bed and lowboy dresser date this set as older than furnishings in the other bedrooms. 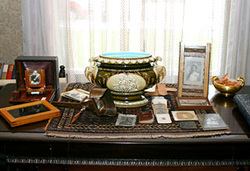 Edith's doll and Robert's Indian collection are museum quality relics of childhood. The front door opens to the entryway. Callers would leave a calling card, or wait on the leather cushioned window seat. We view the bottom of the grand staircase from the entry. The tallest pillar is made from one tree. On the newel post is a Patrician lamp with a Tiffany shade. 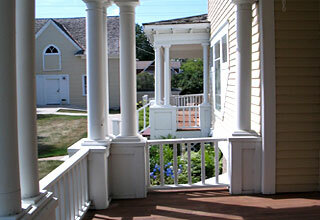 The baluster uses groupings of three. The beautiful paneling is all straight-cut millwork. 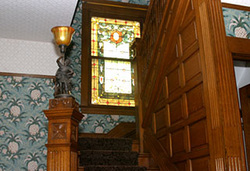 From the top of the stairs, we view the largest of the stained glass windows. All the colors of the outdoors are incorporated in the window: the blue of sky, green of grass, yellow of sunshine and the colors of flowers. Oak woodwork throughout the house is in perfect condition. 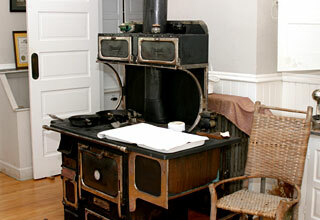 The mantle and over-mantle are examples of the artistry with which wood was used in the home. The stained glass window facing the west shows up brilliantly in the setting sun. Its colors reflect from the mirror over the fireplace. The Victrola with Caruso Records stored inside reflects the Christies' refined tastes. 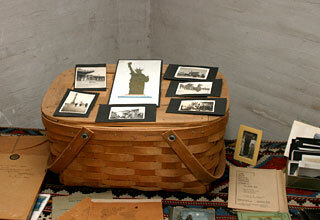 Its original packing crate was found in the carriage house, insured for $300 in 1903. Pocket doors close off the living room. Red burlap wall covering matches the original. The stained glass window is the Horn of Plenty pattern. The massive buffet has ornate carving. The matching table has the leaves stored inside. A walk-in closet stored table linens. Quilting supplies and the bobbin lace-maker were found in the drawers of the closet. French doors separating the living and dining rooms are exceptionally fine because of the beveled lead glass. The pantry is typical of homes of this period. Large cupboards were used for good dishes. The dinner bell was used to call family and guests to dinner. Three built-in and one freestanding bookcase hold volumes dating back to 1880. Stained glass windows representing the Lamp of Knowledge, the Medical Caduceus, and the Lyre for the arts reflect the Christie family values. 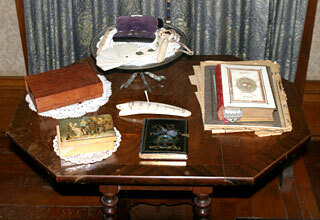 The medical ledger on Dr. Christie's desk shows the cost of medical care in the early 1900s. Family names and histories go back to pioneer times. 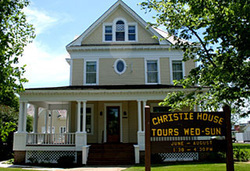 The Christie House Museum was recently added to the National Register of Historic Places.